Claret took another Reserve Champion at the West Coast Alpaca Show!!! 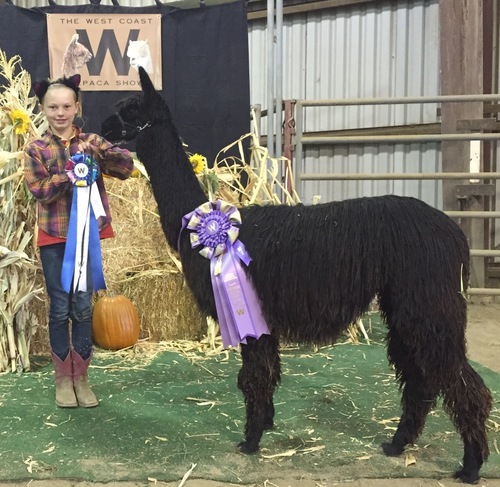 She is a half sister to RGSA Rogue's Pear Blossom who is a multiple Champion female from Rogue Suri Alpacas and received a perfect 20 out of 20 for Fineness and Handle at this years 2014 Suri Network All Suri Fleece Show given by Cheryl Gehly. Cheryl also said it was the first time she has given a Perfect score for Handle! 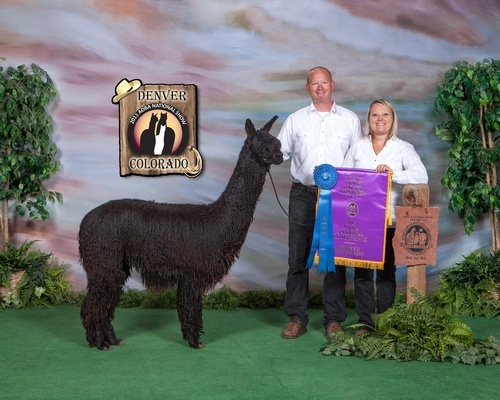 Claret, with these genetics is sure to impress the judges being sired by 12X Champion GLR Nico! This girl is sure to be nothing short of amazing! Every once in a while there is a girl that really catches your eye, for us it was Claret. Born from one of our best foundation females we knew she was destined to be something great! Claret is a half sister to RGSA Rogue’s Pear Blossom, a 5-time Champion and Spinners Cup Winner, Claret didn’t let us down when she herself took 2 Reserve Championships of her very own. 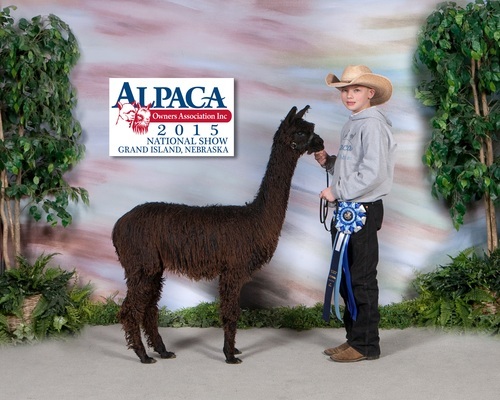 Her sire is none other than Futurity Champion Producing GLR Nico, a 12X Champion and 1X Judges Choice winner! 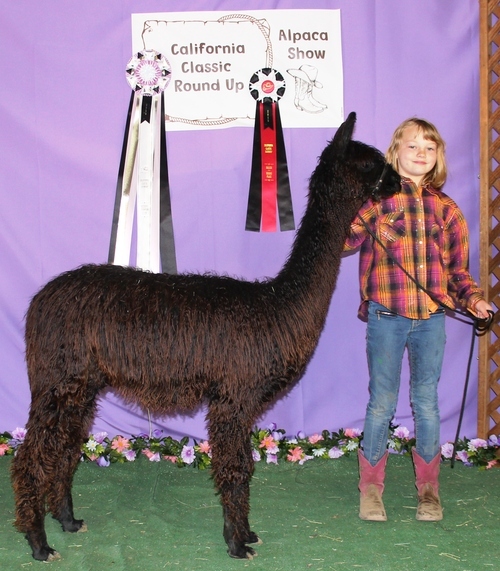 Claret was bred to 19X Black Champion Sierra Bonita’s Peruvian Sniper!! 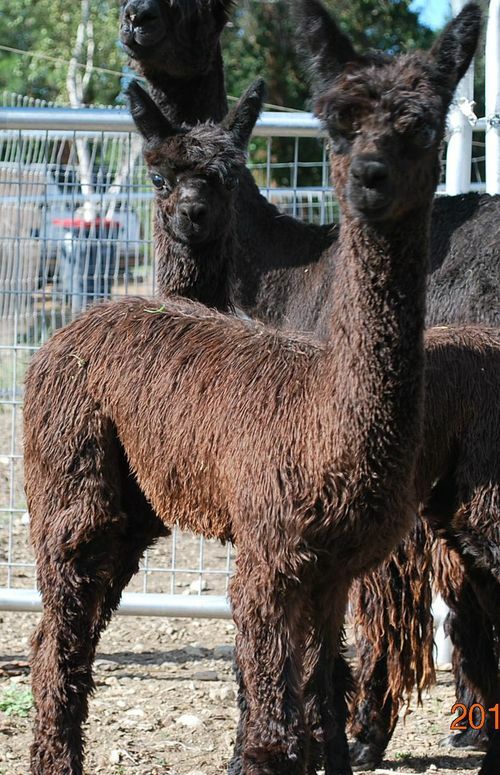 “Rogue Suri Alpacas RGSA Claret by Nico” was biopsied as a 24 month old true black suri female with ARI# 32804935. Her 15X scan shows fiber clusters that appear irregular in size, shape and placement within her connective tissue. Her density is 49.25 fillicles SQ MM of skin and her S/P ration from 25 normal fiber clusters averages 11 to 1. She grades a level 3 of 4 gland presence and 100% of her secondary fibers show medullation. 100 secondary fibers average 20.9 microns while 50 primary fibers average 27.1 microns for a variation of only 6.2 microns. 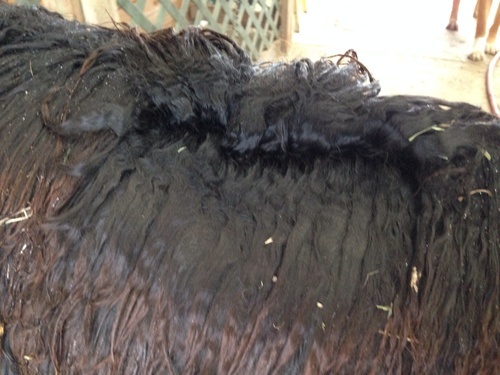 Claret’s strong points are her above average density, S/P ration and her overall fineness of fiber.